Autumn has really hit hard this past week, and although I am not a fan of rain, there is a certain beauty in intensely hued trees towering into dark skies. It is no longer raining today, but misty. The vivid yellows on the leaves of my cherry tree and the dusty pinks in my hydrangeas keep everything from looking all too gloomy. Nature always provides a perfect balance. I harvested the last of my apples yesterday — a harvest which has been very generous. My tree has not only provided plenty of snack opportunities, but everything I’ve baked since early September has included freshly-picked apples. Like my apple muffins with confiture de lait, my apple-pecan bundt cakes with brown sugar-cinnamon glaze, the caramelized apple cake inspired by a Julie Andrieu recipe, and my Frenchified Dutch apple pie. 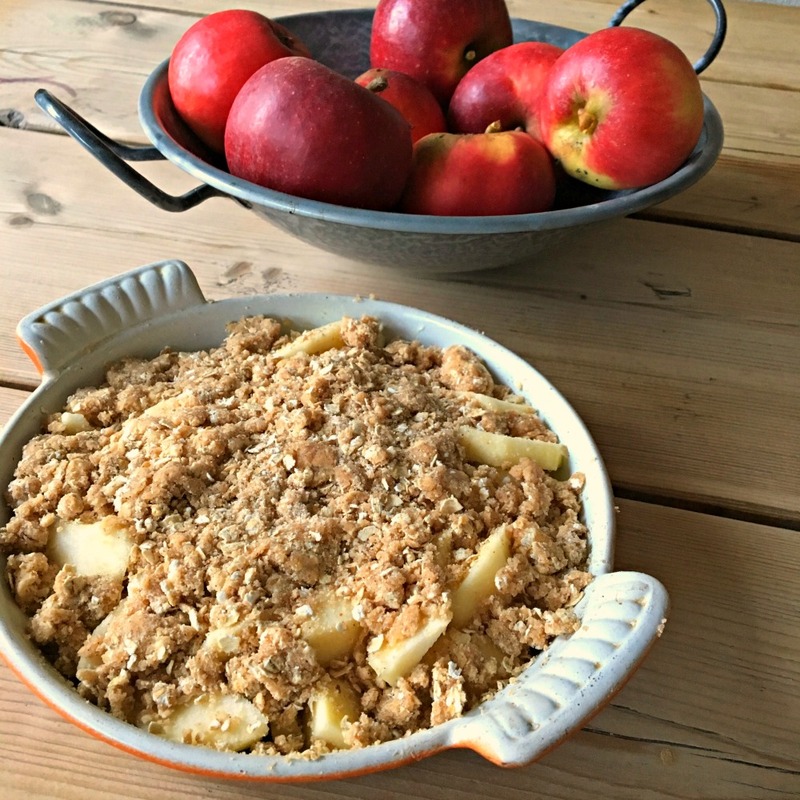 Yesterday it was time to make a crumble, one of the easiest fruit recipes ever. What I love about this recipe is that it is relatively easy on the waistline (a good thing after last night’s meatloaf dinner! ), and it calls for simple ingredients. 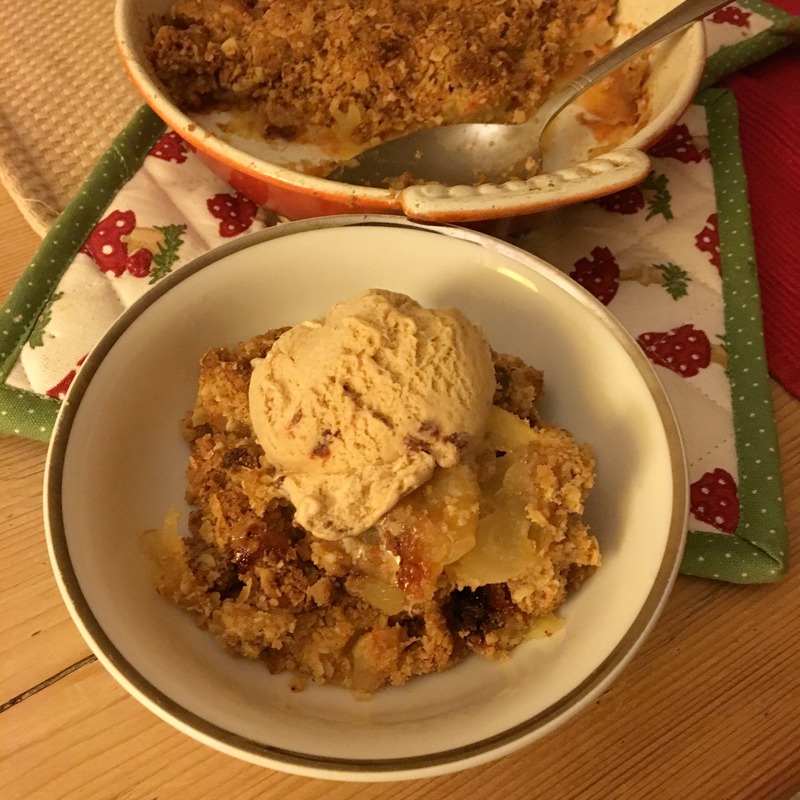 I always like to serve my crumbles hot out of the oven with a tiny scoop of ice cream. The contrast is absolutely delightful. Here’s my recipe. Have a cozy, autumnal weekend! Preheat the oven to 200C and lightly butter a small, round oven dish of approximately 18cm. Put the apples in the buttered dish. Mix the flour, oatmeal, ground almonds, cinnamon, nutmeg, salt and sugar in a bowl. Rub in the butter with your fingertips. 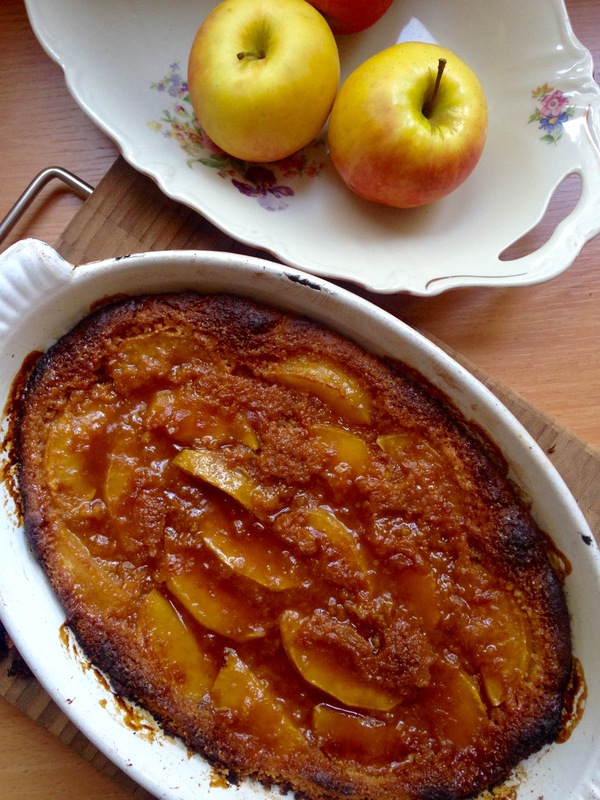 Spread the mixture over the apples and bake for 30-35 minutes. Serve hot with a scoop of ice cream. I had a bit of a chuckle yesterday when a few gentlemen on Instagram called it to my attention that I was stirring my risotto too fanatically. Wasn’t it Nigella who once said stirring risotto is very therapeutic? Perhaps I was in need of some ‘therapy’ yesterday and that clarifies my overzealous wooden spoon action? Well, not really. Although I suppose there’s a right and a wrong way to do everything, I find that my rough-handed method results in a creamy risotto without the need to add extra butter at the end. Not, that I have anything against butter! Anyhow, let’s get on to the recipe that caused the commotion. 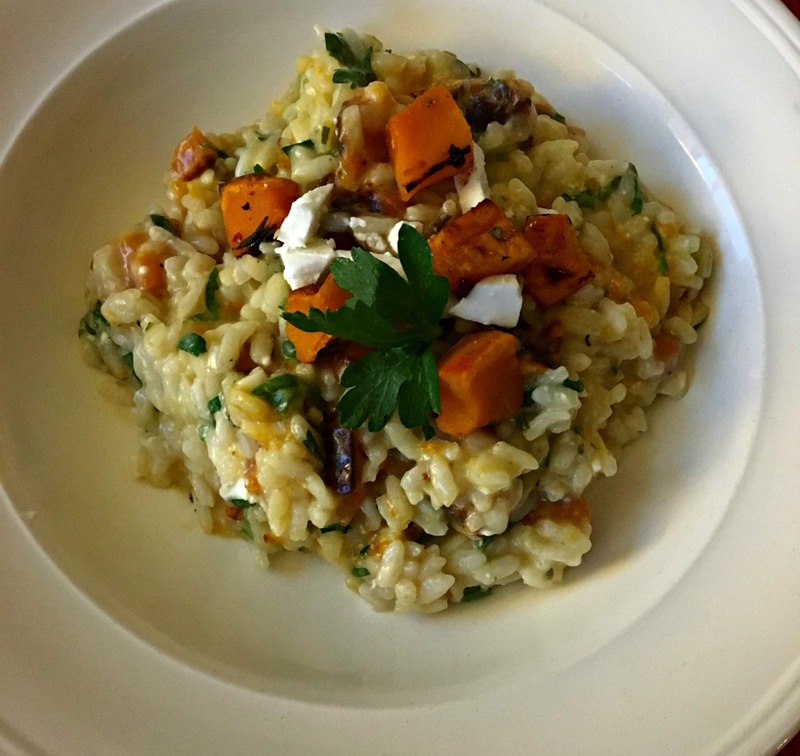 A delightful roast pumpkin and feta risotto which you will definitely want to make this autumn. Enjoy! Preheat the oven to 200C. Put the pumpkin, sage, chili flakes, salt and pepper and extra virgin olive oil in a large bowl with fitted lid and shake vigorously to mix. You can also do this in a Ziploc bag. Spread the seasoned pumpkin over a baking sheet lined with baking paper and bake for 25 minutes. Once baked, leave to cool. Heat the mild olive oil in a heavy-bottomed pan and gently sweat the spring onion, shallot and garlic. Add the rice and stir for a minute or so, making sure all the grains are coated with a layer of oil. Add 100 ml of the stock, reduce the heat and continue stirring until all the liquid is absorbed by the rice. Add the remaining stock in small amounts and stirring continuously. Add more stock only when the last bit is completely absorbed by the rice. You probably do not need all the stock. Test a few grains of rice after about 15 minutes, but usually it takes 20 minutes before the rice is just right; soft but with a little bite (al dente). If that is not the case, continue to add more stock and stir. Taste the rice again after a few minutes. Once cooked, remove the pan from the heat and stir in most of the feta, pumpkin and parsley. Allow to stand for a minute before serving. Top each portion with the remaining feta and pumpkin. We have been having a wonderful autumn here in the Netherlands. So lovely, in fact, that I’m not missing summer as much as I thought I would. The days are sunny and crisp, and the leaves are just starting to change colors. I’ve already traded my slippers for my furry boots, and the thick sweaters have emerged from the attic once again. Walks with Pastis are refreshing and invigorating… instead of hot and sweaty. Hmmm, I may start liking this season after all! One thing that’s great about autumn is the food. Apples, pears, figs, plums, mushrooms and pumpkins, to name just a few. I’ve used them all these last few weeks! 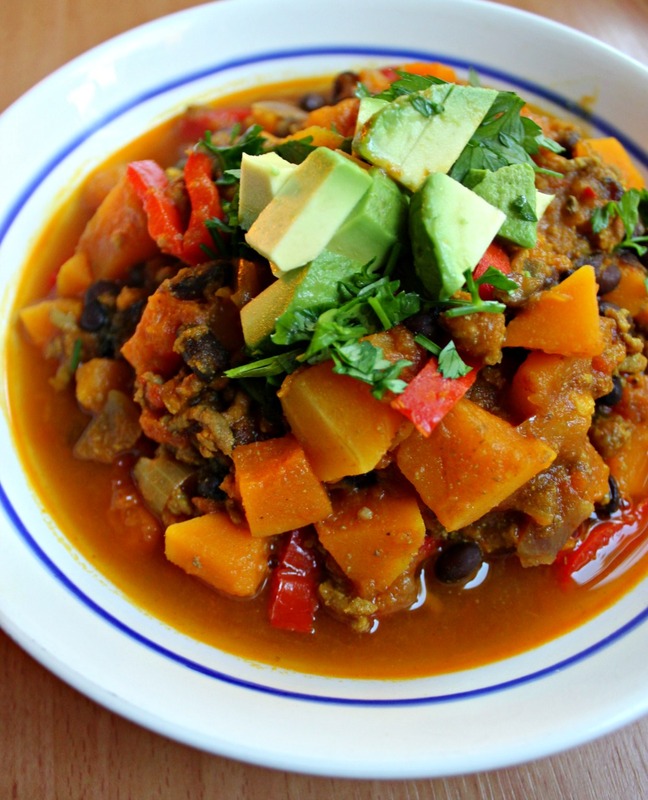 A few days ago I made chili with beef, black beans and butternut squash, and it was a hit at my house. Spicy, slightly sweet and very warming. And to tame down the heat and make it extra delicious, I topped it with cubed avocado. 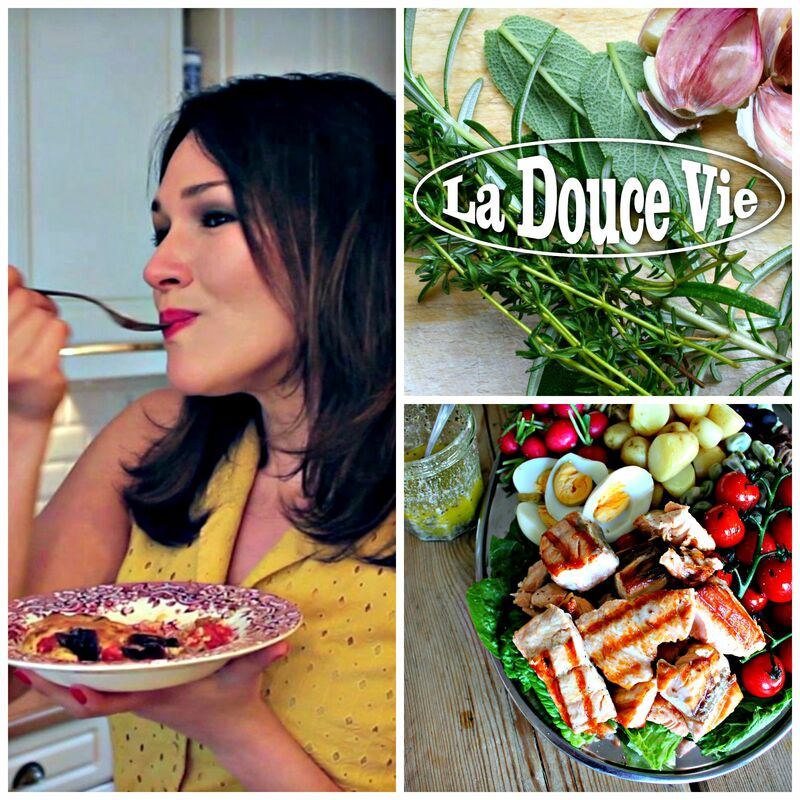 Here’s the recipe! Heat the olive oil in a heavy-bottomed casserole and gently sauté the onion for 6 minutes. Add the chili and cook for a further 2 minutes. Add the ground beef, cumin, coriander and turmeric and brown the beef for 8 minutes. Tip in the tomatoes, add the stock and the squash, season with salt and pepper and bring to a boil. Reduce the heat, cover and allow to cook for 15 minutes. Add in the red peppers and beans, and stir in the sugar. Cook for a further 15 minutes. Serve with chopped parsley and cubed avocado.